3.4 million people from across Great Britain discovered the joys of Heritage Open Days this year, with 2 million visitors sampling the four-day festival for the first time. Evaluation of the 2015 events show satisfaction was up on last year’s rates, with an overwhelming 97% of visitors and 93% of volunteers enjoying their experiences, while 85% of visitors reported feeling happier as a result. 85% of visitors said their wellbeing was enhanced as the festival either helped them to relax (78%), keep active and healthy (71%) or made them feel better about themselves (64%). 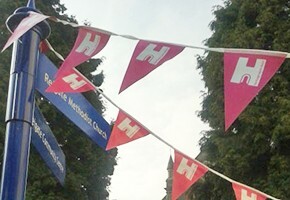 Increasing number of places of worship now take part and benefit from the publicity and support provided by the HODs local and national Team. For the first time, Heritage Open Days assessed the festival’s economic impact. In total, Heritage Open Days is estimated to be worth a minimum of £15 million to local economies. With admission to every single one of the 4,855 events in the festival free of charge, an estimated £9 million was spent on food, shopping, travel or accommodation as part of people’s trip to the local area, supplemented by a further £7 million of secondary spend on refreshments, souvenirs or books at individual events. “Participating in Heritage Open Days makes a real difference to both individuals visiting and communities hosting an event. This is largely due to the wonderful work of the 48,000 local organiser and volunteers who make this grassroots festival happen. Volunteers spent over half a million hours on opening up places to the public, sharing their expertise with passion and panache and making Heritage Open Days a truly transformative experience”.